Older cats are less active than younger ones. 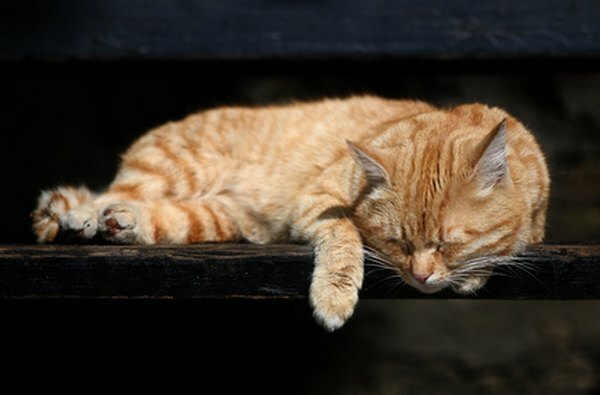 As your cat enters his golden years, between 7 and 10 years old, he begins to slow down, napping more than he used to. Adjust your furbaby's diet accordingly, to account for his lower energy needs and any health issues that may begin to crop up as he ages. A senior kitty whose activity level has decreased needs fewer calories than a young, energetic one. According to Cat Channel, a senior cat needs about 25 to 30 calories per pound of weight each day to maintain his health, as opposed to a younger one who needs about 35 calories per pound. Look for foods that are specifically labeled for senior cats, those over 7 years old, which contain higher amounts of fiber and lower amounts of fats to keep your cat feeling fuller with fewer calories per serving. The extra fiber also lessens constipation, common in elderly cats, according to the 2ndchance.info website. Both canned wet food and dry food provide your senior furry friend with the nutrition he needs, but the choice of which one is best for your feline depends on his tastes and health. Some older kitties prefer the taste and texture of a dry kibble, which can keep their teeth clean and scrape away tartar. Others may prefer the stronger aroma of canned cat food, which has a softer texture that makes it easier for older kitties with dental problems to eat. Canned food also contains much more water, consisting of about 75 percent moisture, according to the U.S. Food and Drug Administration. This helps to prevent dehydration, especially common in older cats, according to the Feline Advisory Bureau. Foods that state on the label that they adhere to the nutrient profiles or have passed the feeding trials of the Association of American Feed Control Officials provide your elderly kitty with well-balanced nutrition. These foods contain the vitamins, minerals, fats and essential proteins your cat needs to maintain his health. Senior kitties, and cats in general, need protein from animal-based sources to obtain taurine, an amino acid that their bodies can't produce naturally. A whole meat should be the first ingredient of any food you feed a senior cat because manufacturers must list all ingredients in descending order by weight, according to the FDA. Antioxidants like vitamin E and beta-carotene help to slow the signs of aging by fighting free-radicals in the body that can cause tissue damage, according to the American Society for the Prevention of Cruelty to Animals. Foods designed for senior cats have higher amounts of these antioxidants than those labeled for adult cats. All foods that meet the requirements of AAFCO's nutrient profiles contain at least 26 percent protein and 9 percent fats, required for proper nutrition of your senior feline, states the FDA. Health issues in an aging kitty can affect your cat's appetite, causing weight loss. Rapid weight loss in a cat is very dangerous because it can lead to hepatic lipidosis, a condition that can cause liver failure. Possible causes of weight loss and loss of appetite for your furbaby include dental problems, pain from arthritis, kidney disease, cancer, heart problems and hyperthyroidism. If you notice a decrease in your kitty's appetite, a trip to the vet is in order to determine the cause. In some cases, a special, prescription diet to treat certain health conditions may be in order. For example, elderly cats diagnosed with kidney disease may require a diet low in phosphorous, protein and sodium, according to WebMD. Once you have addressed any medical issues that could be affecting your senior kitty, stimulate his appetite by switching your cat to a canned food diet from a dry one. These foods smell more pungent than dry foods do and you can heat them for a few seconds in the microwave to enhance the aroma. A dash of low-sodium beef or chicken broth can also entice your kitty to eat as he gets older and increase his water intake to prevent dehydration. A healthy older kitty may continue to eat the same as he did as a youngster, but as he slows down, the same amount of calories he's always been fed can quickly pack on the pounds. Obesity in older cats is an issue that can lead to health issues such as diabetes. If you notice that your cat appears to have a round shape and you can't feel his ribs, he may be obese. Consult your veterinarian to place your furbaby on a calorie-restricted diet. Foods lower in calories and higher in fiber can satisfy your cat's hunger without reducing the portion sizes that you feed your cat. For older cats diagnosed with diabetes, a food that is high in protein and low in carbohydrates can not only play a role in managing the disease but also allow him to lose weight. Do Cats Get Groggy After Shots?